“Claims from Premier Baird that the Great Koala National Park will cost 3000 jobs is a classic case of scaremongering,” said NCEC spokesperson Ms Susie Russell. “We were hoping that the Premier and the Liberal-National Coalition, would come forward with their own policy that would save our region’s koalas rather than muddy the water with inaccurate and unsubstantiated statements about job losses and economic collapse. “In 2008-9 the Government forestry agency claimed that there were a total of 6344 people in the whole of NSW in State Forest dependent employment- forest management, harvesting and haulage, and primary processing. “The pine plantations produce about three-quarters of the sawn forest product and are the greatest generator of employment. The remaining 1600 or so workers are employed across the whole of NSW including the River Redgum, Brigalow-Cypress forests, southern NSW including the Eden woodchip facility, hardwood plantations and the native forests of northern NSW. Since then the Government itself reduced the forest management workforce by at least 50. “It is clear that any impacts from the Great Koala National Park would be at least one and possibly two orders of magnitude less than the Premier is claiming,” she said. “We want a Premier and a Government that seeks to generate employment and opportunities while conserving and showcasing our natural heritage, not one that is prepared to let Australia’s most iconic animal go extinct in the wild from it’s last major stronghold in NSW. “In 2015 most people don’t buy hardwood floorboards. And those who do will think twice knowing that they are walking on wood that came from forests needed by koalas to survive in the wild. “We want a forward looking Premier looking at developing sustainable industries, providing re-training where necessary and exploring timber alternatives. 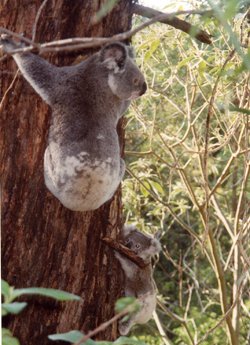 “We ask the Premier consider the future of koalas and the communities of the north coast. We can be best served by a calm debate about the issues, based on facts, rather than shrill shouts of ‘we’ll all be rooned’, Ms Russell said. This is a constructive reply to the same-old LNP narrative which is rooted in the past. The nSW Government needs more than a fresh face up front , it needs fresh ideas, forward thinking alternatives to usual blather about jobs. They need to be thinking about the new jobs that are possible with retraining and the production of new alternatives to koala wood.